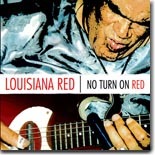 Blues veteran Louisiana Red comes out with one of his best albums in his 50-year recording career. No Turn On Red is this issue's Pick Hit. For a taste of Southern Fried Soul, pull your chair up to the Blues Bytes table for a big helping of soul singer Bill Avery. His impressive new CD is this month's Surprise pick. We take a look at a couple of older re-issues featuring early '70s sessions when New Orleans pianist Professor Longhair was making a comeback. Two CDs are covered in this month's Flashback. This month's What's New section features new releases from Artie "Blues Boy" White, Beautiful Bobby Blackmon, Michele Lundeen, Ann Rabson, Jimi Bott, Dave Specter and Steve Freund, Tommy Castro, Carlos del Junco, Eddie Turner, Gary Kendall, and more.